» Forum » All Pinball » All modding! » Pinball 2000 Glass, Is it just a mirror tint? » Pinball 2000 Glass, Is it just a mirror tint? Pinball 2000 Glass, Is it just a mirror tint? I am getting ramped up for my build of a Digital Pin sim in a custom P2K Cabinet.. And while shopping for parts, I realized just how EXPENSIVE the glass is for these!! So, being the DIY out of the Box kind of thinker I am paid to be.. I started postulating ideas as to how to replicate it. I can't find a good picture of the glass itself, but it seems to me, it is just tempered glass, with the top 3/8's having a mirrored tint on it, like you see on cars these days. If that is the case, my local glass shop could replicate it for about $60. Could someone that has a Pinball 2000 look at their glass and confirm this one way or the other for me? And if it is tint, does anyone know the percentage of the tinting? It's not just a tint. And you can do this without the glass. Just mount the monitor in the bottom cabinet where the reflection would be and bezel around it. A 37" screen fits with plenty space for the second monitor. The end result looks the same and requires no special glass, does not require special software to support mirroring. I have a Pin2K vpin and its awesome. I am using an original pin2k glass. I got the glass cheap from a friend since it was scratched, but it works fine on my cab. Its about 1/3 tinted at the top and clear the rest of the way. If I was going to do it myself, I would tint it maybe 1/4 of the way from the top with the NightShades product available at autostores. It is a gradual reflective tint that starts about 1/3 or so from the bottom of the glass and gets darker towards the top. So just slapping a sheet of tint on standard glass isn't going to give you the same effect as the real stuff. Its about 1/3 tinted at the top and clear the rest of the way. Look at it closer, you'll see this isn't the case. Well it looks tinted to me. For his purpose the NightShades Tint would work fine. It just has to be tinted at the top to show the reflected DMD/or displays on the upper part of the glass. You can get something like the size of a large SEGA dmd image on the glass if you use a 23 inch LCD monitor reflecting down in the backbox and it fits nicely. Not sure how far you got in the project yet. Greg is getting ready to start building my cab, I was planning on doing the Nightshade route, but he has built several and says the end results are far better with the actual glass. I will be using a 39" screen in mine. I had thought also about seeing if I could mount the DMD monitor under the glass as well, but I like the neat and tidy look of it being above the playfield.. Plus that area behind the PF Monitor will house my strobes and flashers. I think that would mess with the monitor projecting up. As far as flipping the display, it is just a simple registry key for each table that does it and I can write a script to do them all at once. So that is not too much of a pain. I was just speaking with Greg and I think he is going to get me some pics of his glass in a couple weeks. He says the tint is a dot matrix style tint. I have a buddy here in town who does high end tint jobs of luxury cars and buildings. My thought is, I MAY be able to get him to figure out what the tint they actually use is. If so, we could have a much cheaper alternative to the P2K glass. I can't wait to get my flat pack cabinet here so I can start tossing in goodies!!! I have been dreaming about this for a little over a year! And I have a thread here and a couple other places looking for good deals on the cabinet hardware I will need. Plus I have a couple bots running to let me know of good deals on the force feedback gear I will be needing. At one point in time I think there was someone offering a reproduction of the P2K playfield glass, its possible the piece he has with no gradient was one of those, I think it has been quite awhile ago but remember reading something on this somewhere. awarner and I just got some NOS glass for our RFMs. It had the screen printed gradient on it that needed to be removed with paint stripper. So apparently the process of making the glass was to screenprint a coating wherever they didn't want the mirrored stuff to stick. So I'm not sure that the mirror itself was less tinted, but rather there were little dots that got bigger to do the gradient type stuff. I should have taken some photos while we did it. The paint stripper stuff hurt like hell when it got on my hand too! I apologize in advance for taking the thread a little off course, but I'd picked up a NOS sheet of 2k glass with that same protective(?) coating. I was told to using paint stripper to prep the glass, but I'm a little concerned about damaging the gradient portion of the mirror coating in the process. Did you see any issues with that, and what did you use to strip the glass with? The auto tint won't provide the reflection you need. I exhausted this route before just remounting the monitor. 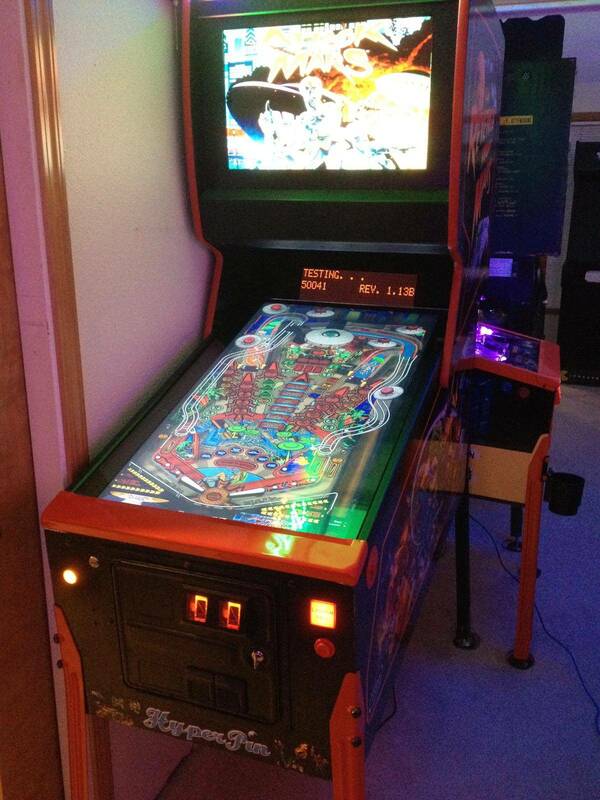 In pin2k machine you need the reflection because the playfield is in the location where the reflection shows up. However, on the vpin you will need it to show up behind the playfield. Turns out you can mount the monitor in that exact location and bezel it out. I ended up doing that. Yes it's a registry key. And my setdmd app I wrote will fix the registry entries for you at once. But that's not enough. That registry is only valid for pinmame. Anything that uses displays without pinmame won't flip and those tables will be unplayable. Examples of those might be JPSalas spiderman and his pirates. There are others. Also any future engines that require Dmd on another monitor will be out for you. Not to mention that half my playfield monitor is not covered by ugly gradual tint so the playfield monitor looks way better than it did with the pin2k glass. The stripper didn't damage the gradient at all. I was worried about the same thing. We actually had three sheets of glass in case we screwed up one of them, but the stripper worked fine. We just dabbed it on with a paintbrush, waited about 10 minutes, then used a squeegy to pull it off the glass easier. Use a little more if a spot needed some more. Then I think we used a little mean grean to try and get some of the paint thinner muck off. Followed by about 5 or 6 rounds of glass cleaner. The stuff we used was in an orange metal bottle. I'll see if I can get the real name of it, but we got it at home depot. Source at "DAZZ" from the hyperpin forums. He built on of these and it came out killer. I don't recall if he used real pin2k glass or not but he's a great source for this type of cabinet. Markmon is right that anything not using pinmame will be a big problem. Something you want to account for as with (forget the guys name) writing the B2S program that takes a lot of the programing skills out of the process I feel more tables will be built using this vs just a full screen version. Yea anything not using PinMAME... Or FuturePin, I have a couple of possibilities for. I can display the DMD on the backglass monitor, or there is a possible trick to make FP show the DMD on my 3rd Monitor anyway. I will talk to Dazz, as I am a member at his new forums, VPUniverse.com and see him on chat everyday. But I think he used the spray on tint. Also... out of curiosity.. Why are you buys buying P2K glass and stripping it? Future pinball isn't the concern. It's the visual pinball games that are not driven by pinmame. Also, if you get into something like pinball fx2 when it comes out in a month or two, you'll not be able to use the inverted monitor. My set up looks exactly like it did when it was reflecting into the glass, but the monitor is simply mounted in the position where the reflection was, and then bezel is installed. Simple solution and save the $300 for the cost of the glass. Dazz just used regular glass, no tint, no mirror. Just plain glass. Markmon, do you happen to have any pictures of your setup? Aslo, do you have your Feedback LEDs in that area? This seems to be taboo to ask on the related forums.. So I will ask here. Does anyone know where I can d/l or buy a large chunk of the Cabinet ready Tables with related artwork/videos/and XML ready to go? It is not that I CAN'T get them on my own individually.. and have Premium memberships at the required sites... But wow this is going to take a long time to get set up. Much longer than it will take me to build the entire unit. YOU DID NOT JUST DO THIS!!! NO WAY!!!!!! I tried regular glass compared to the pin2k glass and there's a huge difference. Thanks for the pic. That looks like a pretty nice build! That is a neat look, I will have to play around with it and see what I like. My PF monitor will actually be even lower in the back it looks like, as I am mounting mine at an angle. I hope to have my cabinet here in a couple weeks. Nice build so far! I'm glad you got someone to build your cabinet for you as those curves and such can be a bit interesting to replicate! I'll be watching intently! Great build and it looks like the end result will be amazing! Thanks I was REALLY fortunate to find Mameman. I will be getting his first flatpack cabinet ever. I am hoping to have it shipped to me so I can assemble it within a couple of weeks. I have a build thread over at the hyperspin forums and at VPUniverse.com if you want to check it out. The thread is Optimus-Pin. 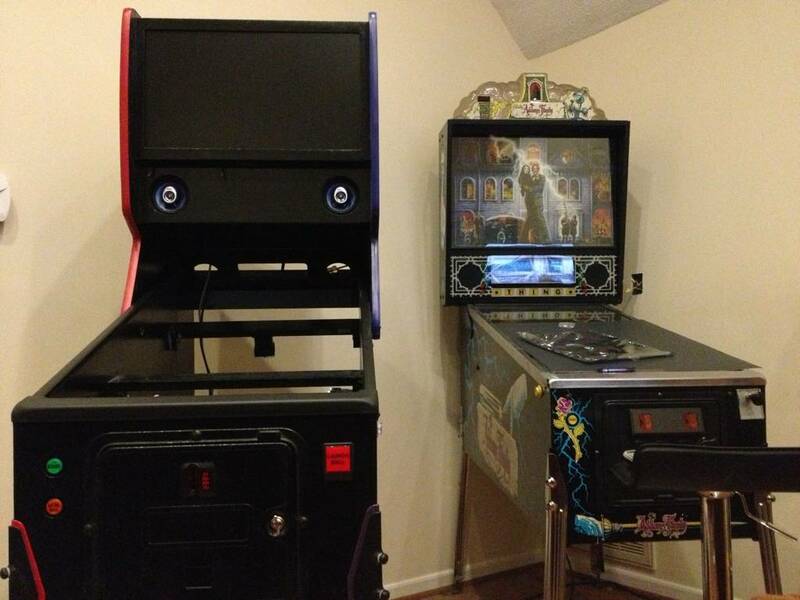 Tomorrow I will get the buttons hooked up and install the Play Field LCD, so I can play a couple games. I hope to have most of the force feed back gear wired by the end of the weekend, so I can enjoy my President's day off... Playing Digital Pinball!!!! Interesting. I have a real pin2k cabinet that i converted to a pin2k vpin and use the pin2k glass with a 23inch lcd inverted and i think it looks terrific. The dmd display is huge since it fills the back of the playfield section. If i had to say anything negative about the setup is the back area of the playfield is a little darker due to the gradient in the pin2k glass. Nice!! That table looks awesome. I have to add it once I finish my hardware setup. Mine has no tint in that video.. And I am still working with the spray on Tint. I did not spray it low enough when I tried it out... So I have to scrape it off and start again. But first I am going to play around with my RGB LEDs and Strobes placement.. Then I may or may not move the DMD up a bit. I am using a 22" for the DMD and a 24 for the back glass. Resurrecting this as it seems to be the most relevant place for the question. Is there any mileage in using something like Krylon Looking Glass spray on some plain glass? Pinball 2000 glass is about 4 times more expensive here in the UK! That's obviously going to be pretty hard to recreate exactly but a mirror tint spray could be applied in more coats where it should be more opaque. I might get some and try it on a scrap piece of glass unless someone tells me that it's a horrible idea. I had a proper look at my original P2K glass today. It seems to have a pretty solid tint over half the surface and a gradient over the next 6 inches or so. I can't think why so much of the area needs to have a tint. Even so, I'm going to try and replicate it with varying coats of mirror spray. Hello there, would like please to know if there were any progress ? Got an RFM pinball with glass quite scratched and cannot find anyone that sells and ship such a glass. Sorry for the late reply. The mirror spray didn't work. By the time there was enough in place for a reasonably strong reflection, there was not enough of the playfield visible. It just looked like a dirty old mirror. Certain runs of the glass used a screen printed gradient to apply the mirror etching material and keep things even up the playfield. At the time, the glass WMS ordered went through an 8 step handling process, but I think it might be possible to get a familiar effect by using a screen printed gradient with mirror tint rather than just applying it by hand. On some of my P2K glass, you can actually see the individual pixels of the gradient from the screen printing process.